Keynote speaker Ingvil Smines Tybring-Gjedde with IBP´s Milton Costa to the left and NBCC president Rachid Felix to the right. For the supply chain, decommissioning and revitalization needs in the Brazilian offshore sector means new business opportunities. 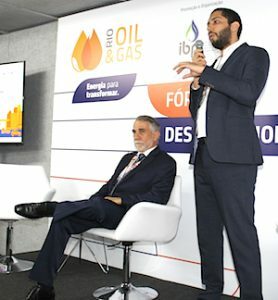 During Rio Oil & Gas 2018, NBCC and IBP organized a decommissioning forum focusing on the opportunities and challenges that the decommissioning scenario creates. The forum also provided a view of the market and helped the participants understand and prepare for this new scenario. 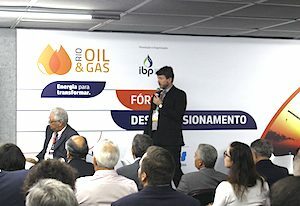 The forum took place in Rio Centro on September 25, and in the opening remarks, Milton Costa, Secretary General of IBP, said that not only decommissioning, but also revitalization will be the name of the game the next years, as many production units are coming towards the end of their life cycle. IBP has created a committee dedicated to decommissioning and revitalization, and Mr. Costa believes that Brazil has a lot to learn from Norway when it comes to recovery rates. Revitalization of old production units could increase the Brazil average of 21 percent to something closer to the world average of 35 percent. 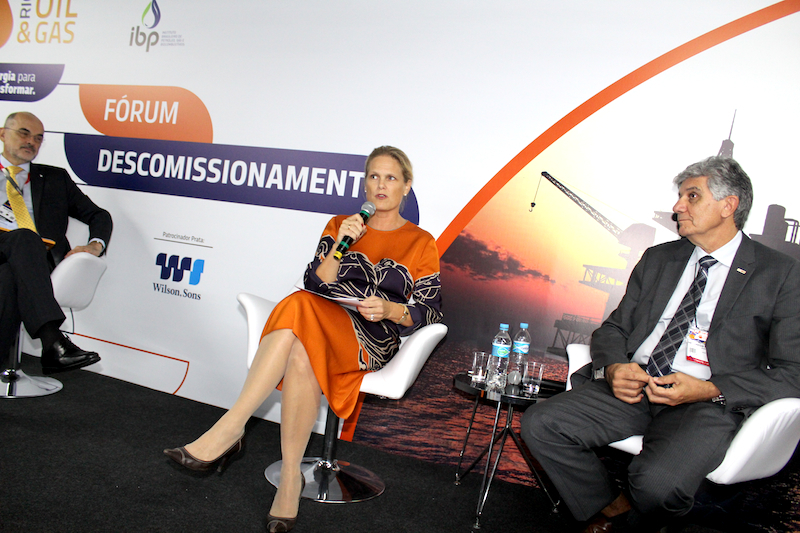 Keynote speaker of the forum was Norway´s Deputy Minister of Petroleum and Energy, Mrs. Ingvil Smines Tybring-Gjedde, and she emphasized the importance of a clear framework and clear responsibilities. «Norway has extensive legislation, and licenses and approvals are required in all phases of exploration and production. The Norwegian Petroleum Act requires an operator to submit a detailed decommissioning plan for the installation five years before production ceases. In general, Norwegian legislation requires the removal of the whole installation. Norwegian fields are also aging, but we have good experiences in increasing recovery by using infrastructure already in place. I believe that Norway and Brazil together can increase value creation and decrease cost», she said. After the keynote, Mr. Eduardo Zacaron of Petrobras, gave a status report on the decommissioning scene in Brazil. Petrobras has seven ongoing decommissioning projects, and detailed plans need to be made for the different phases – the removal of the platform or topside installations, the subsea systems and the wells. Reducing the cost of decommissioning makes it more attractive to invest in mature fields. «Decommissioning is the last option, our priority is always to maximize recovery. These projects demand long-term planning and we count 7 years from we start planning to the actual removal», Mr. Zacaron said. Luiz Hayum and Luiz Fernando Oliveira (to the left). Research Analyst Luiz Hayum from Wood Mackenzie presented an analysis of the Campos Basin, questioning the best strategy – re-develop or decommission? The report states that infill drilling could help boosting recoverable volumes. On Roncador, Marlin and Polvo, 43 new wells would unlock an additional 1,5 billion barrels. «Today we see that majors and large independents have shifted to more lucrative deepwater fields, opening space for other operators in small, shallow-water fields. This offers redevelopment opportunities, but not all fields have potential for redevelopment», he said. According to the study, the cost of the decommissioning of all Campos Basin units with more than 25 years in operation, by 2025, is USD 8 billion. If the same amount was invested in revitalization, it could add 230.000 boeds and USD 3 billion in additional royalties by 2025. Such an investment would also maintain jobs. Rienk Krol and Kjetil Solbrække. 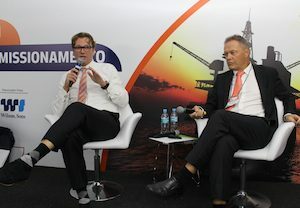 Kjetil Solbrække, CEO of dbo energy and Rienk Krol, representing Seaway 7, shared international experiences on decommissioning to the forum. Both speakers have experience from decommissioning projects. In the North Sea there are 500 platforms to be decommissioned and 450.000 tons of topside installations to be removed the next ten years. «We see a slow increase in market activities. You need to be well prepared, and you need a platform specific approach. Decommissioning involves at least 3 years of office preparations. Every project is different, and it is not generic work. In the planning process you need to deal with unknown modifications of an asset, old information, limited access, hazardous materials and structural integrity issues. A trend we see, is that we tend to over-engineer it, but don´t forget that it will be scrapped in the end. It is a challenging market, but I believe it is our duty to clean up and reinstate nature after we are done», Mr. Krol said. Legal aspects of the decommissioning process were also addressed by the forum. Cost and responsibility are key words, and the law states that the total cost of decommissioning is the responsibility of the licensed oil company or operator. The presentation was made by coordinator of NBCC´s legal committee, Alexandre Calmon, The need for environmental recuperation also came up. 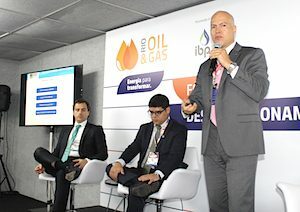 Luiz Fernando Oliveira of DNV GL was invited to present the Joint Industry Project (JIP) that involves Petrobras, Equinor and several others, to the forum. Together they are developing guidelines for risk based comparative assessment for decommissioning of subsea installations in Brazil, also mentioned by Eduardo Zacaron in an earlier presentation. Having clear regulations is important, and the last batch of speakers at the forum addressed regulatory aspects of decommissioning. 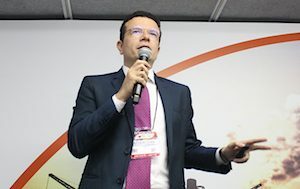 Representing ANP, Marcelo Mafra set the stage for his presentation reminding the audience that 41 percent of the offshore production units in Brazil have been in operation for more than 25 years. Mr. Mafra also talked about the regulatory agenda of ANP and the status of the revision of resolutions relevant to decommissioning. Like in Norway, complete removal of the asset is considered standard procedure. 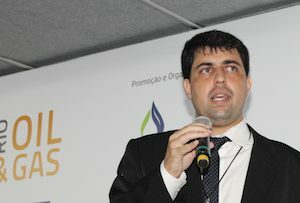 Itagyba Neto shared Ibama´s expectations on the decommissioning scene. «We are noting a paradigm shift where the different players, both industry and regulators are aligned and looking for solutions together», Mr. Neto said. From the left; Eduardo Bim, Itagyba Neto (Ibama) and Marcelo Mafra (ANP). Still he addressed a series of challenges identified by Ibama, like lack of planning, lack of reliable information and different environmental scenarios. «Ibama is not an adversary, and the environment is not something that is hindering economic development», he said.